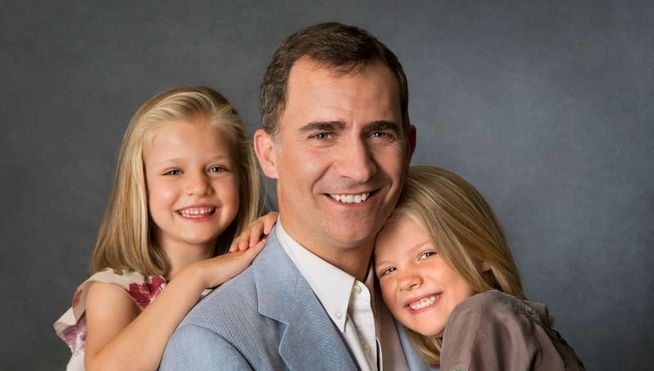 The new King poses with his daughters Spain’s first royal transition since the restoration of democracy in the mid-70s takes place today with Prince Felipe taking over from his father King Juan Carlos, who formally abdicated at midnight last night. Felipe becomes King Felipe VI in a ceremony that will be a low-key affair at the specific request of the new monarch, who is anxious to avoid ostentation at a time when many Spaniards are finding it hard to make ends meet. After his formal proclamation in Parliament, Felipe and his wife, former TV journalist Letizia Ortiz, will be driven through the centre of Madrid to greet the crowds. Changes are already evident at the Palace, with the royal website amended yesterday to remove details of Felipe’s sisters, the Princesses Elena and Cristina, and replace them with the heirs to the throne, his own two young daughters (pictured). Despite being generally very popular, the new King, aged 46, faces a tough job to restore the image of the monarchy, which has become tarnished during the last few years due to some controversial actions by Juan Carlos, including his infamous elephant hunting trip to Africa and more rumours of past marital infidelity. Felipe will also have to deal with a growing wave of opinion that wants Spain to become a republic.